WELCOME TO MY MONEY MISSION ONLINE: Oh What A Week This Has Been! AND WHERE OH WHERE IS SONYAANN?? Oh What A Week This Has Been! AND WHERE OH WHERE IS SONYAANN?? Where, oh Where, did SonyaAnn go? Oh Where, oh Where, can she be?????? I've tried numerous times to access her blog, but she has disappeared. Anybody have any answers???? Just when I thought that life was going to get back to normal, WHAM, something else happens! Isn't that always the way it goes? It started Tuesday, when I gave my little chihuahua, Sasha, her monthly heart worm chewy cube. About an hour later, I noticed that she seemed lethargic, sluggish, and was kind of shaking. I thought that maybe she was just being her nervous little self, so I went about my day and didn't think to much about it. By the evening, she was exhibiting signs of muscle weakness, and I was getting worried. I put her to bed, in her crate, and decided to call the vet first thing in the morning. Next morning, I took Sasha into the vet, and they did blood work, and some sort of pinch test down her back (to see if she injured herself), and they determined that she had some sort of delay down her one leg. They recommended crate rest and steroids, and said that she must of somehow injured herself. Now, my argument is this: She was fine, PERFECTLY FINE, until I gave her that heart worm chewy. She didn't jump onto anything during the hour between ingesting this medicine and displaying the start of symptoms. I know this, because I was with her the entire time. I think she reacted to this popular medicine that tons of people give their animals, monthly, for heart worm. In very, very rare cases, this medicine will cause digestive symptoms (which she had) and neurological symptoms (which she also had). I only know this, because as I was sitting in the room, waiting for the blood work results, I noticed this cardboard display in the room that had information about this popular heart worm chewy. At the very bottom of the information, it listed these rare side effects. I once again mentioned it to the vet, but no, they totally poo-pooed my fears and again said that she must have injured herself. I STILL THINK IT WAS THE CHEWY HEART WORM CUBE. WHAT DO ALL OF YOU THINK? Since I do not drink, and I could really use one by today, I thought I'd post an alternative alcoholic beverage. I love this stuff, and it is even better when there is a coupon for it! 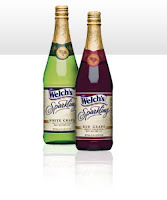 This coupon should make for some very inexpensive Sparkling Juice ! Have a wonderful Friday Everyone! I'm off to the Big Town for teen-daughter's every-three-months doctor checkup. I think the same way you do.Most likely a reaction to the medicine.Most of the time they won't admit it could be the problem.Hope all is well with the re-cooperation. Oh, I think it is the medicine alright. Did the vet give you that medicine?? Perhaps they are covering their hineys by denying it has anything to do with it. I hope he'll be okay. I'll say a little prayer.